The Layout competition at ONELAN’s Annual Technology Event was won by Oxford Brookes University. 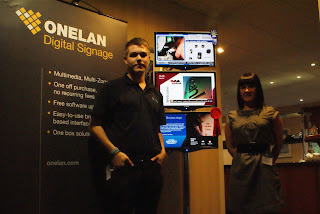 ONELAN Net-Top-Boxes (NTBs) were installed at the University by Image Audio Visual Solutions. The competition proved to be very popular with resellers being invited to submit their best customer Layouts. All the Layouts were judged on a range of criteria relating to both their design and their content. The Oxford Brookes Layout stood out as not only was it a clean, professional and simple design, but it was also particularly good as it followed current design trends. In addition, all too often users feel the need to show everything, and with digital signage, less is more. According to Tyson Reed, Senior Designer at Tymedia Ltd, who assisted with the judging ‘they have grasped the concept of effective digital signage Layout design’.